I first became enamored with the Beatles around 2012, when I began to discover 1960s music as a whole. I fell in love with their songs, musical innovation, and the personalities of the individual band members, my favorite of whom has always been George Harrison. Born in February of 1943 in Liverpool, England, Harrison had a very modest upbringing. The youngest of four children, he spent the first six years of his life in a small home with no indoor toilet and heated only by a small coal fire. Little did he know it at the time, but everything was about to change when in 1958, he auditioned for John Lennon and Paul McCartney's skiffle group, The Quarrymen. 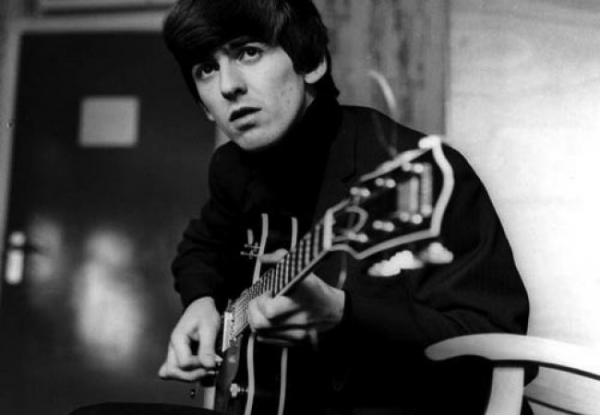 Originally, Lennon thought Harrison was too young to become the group's lead guitarist, but Harrison's talent and pluck soon established him as a member. By 1960, the band had changed its name to the Beatles and began a residency in Hamburg, Germany; in 1961, manager Brian Epstein began to streamline the band's style, and helped them secure a contract with EMI Records and officially launching their UK career with their first single, "Love Me Do." By 1963, the Beatles had acquired the last member, drummer Ringo Starr, and Beatlemania was in full swing. The rest, as they say, is history. Harrison's greatest contributions to the Beatles included his interest in classical Indian music and use of instruments like the sitar and the tabla, which are prominently featured in songs such as "Norwegian Wood (This Bird Has Flown)", and Harrison's own composition, "Love You To". In addition to being at the forefront of the Beatles' experimentation with Eastern music, Harrison also wrote and sang some of the group's most iconic songs, including "Something" and "Here Comes the Sun." After the breakup of the Beatles in 1970, Harrison went on to have a successful solo career, with such hits as, "Give Me Love (Give Me Peace on Earth)," "My Sweet Lord," "All Things Must Pass," and others. Harrison passed away in November 2001 after battling lung cancer; however, he lives on in the hearts and minds of Beatles fans the world over, and his legacy has become a lasting one.